You’ve probably eaten scads of peanut butter cookies in your time. Peanut butter is such an American staple and when it comes to cookies, from school cafeterias to coffee shops to our own kitchens, we’ve all had our fair share of those crispy sandy cookies with the identifying crosshatch on top. 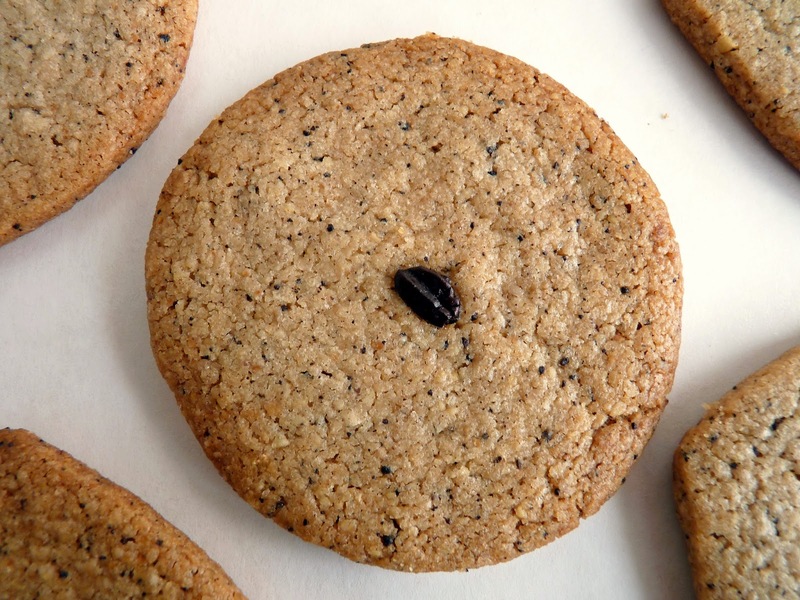 This is a great little cookie from Maida Heatter, one of our most beloved pastry cookbook authors and member of the James Beard Foundation Hall of Fame. These are not made with peanut butter but rather just four simple ingredients that bake into plain crispy, crumbly, buttery cookies riddled with roasted salted peanuts. They are simply addictive due to their simplicity of flavor and wonderful brittle texture. This is probably one of the easiest cookies you’ll ever make. Cream some butter and sugar, add some flour and chopped peanuts. 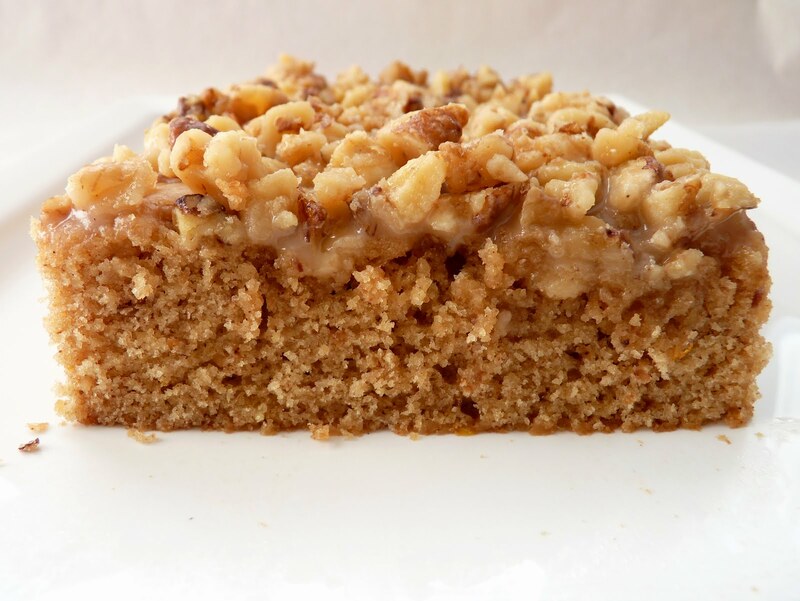 Press the dough into a flat sheet on a pan and bake. No rolling or cutting or piping or chilling. By the time you’ve cleaned up your kitchen, they’re done. Presto! - It's important to note that Maida Heatter sifts her flour and then measures. - To enhance their deliciousness, add 1/2 t – 3/4 t salt, a teaspoon of vanilla or a pinch of chile powder. Or substitute honey roasted peanuts and sprinkle salt on the top. - Although the recipe recommends using an ungreased pan, I used parchment with a bit of an overhang to make it easy to remove. - If you don’t have the right size pan, use a baking sheet and just pat the dough out to the correct proportions, shoring up the edges so they don’t burn. The cookie puffs up a bit but does not spread much, so it works fine. - Cut these while still warm using a sharp chef’s knife. 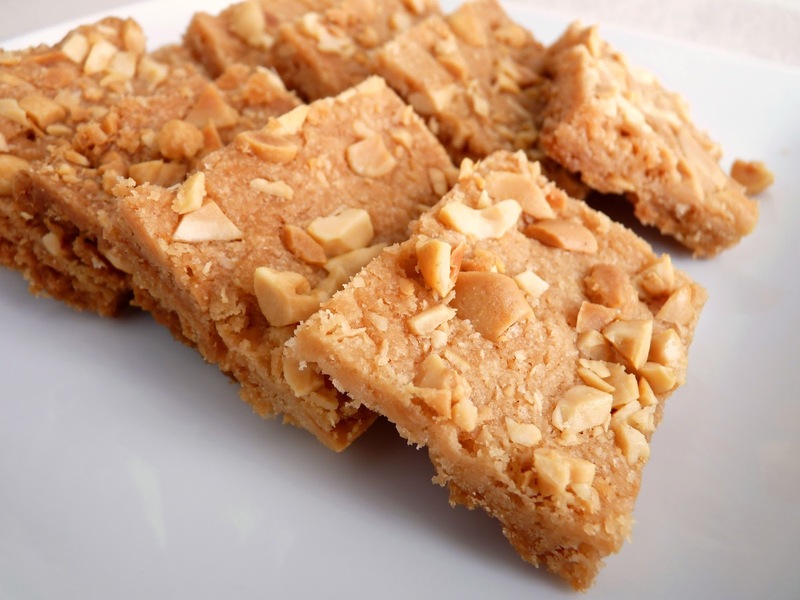 Or you can just cool completely and break into pieces like peanut brittle. Store in an airtight container. 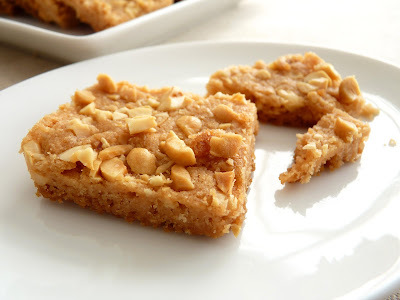 Coarsely chop peanuts and divide into two 1/2 cup portions. Cream butter and sugar until light, about 2 –3 minutes. Scrape down the bowl. Lower speed and gradually add flour. When just about fully combined, stir in 1/2 cup of the chopped peanuts and mix. Turn the dough onto an ungreased 15” x 10” jellyroll pan [I used parchment]. Lightly flour your fingertips and press out the dough into a thin layer. Sprinkle remaining peanuts onto the dough and press to secure. 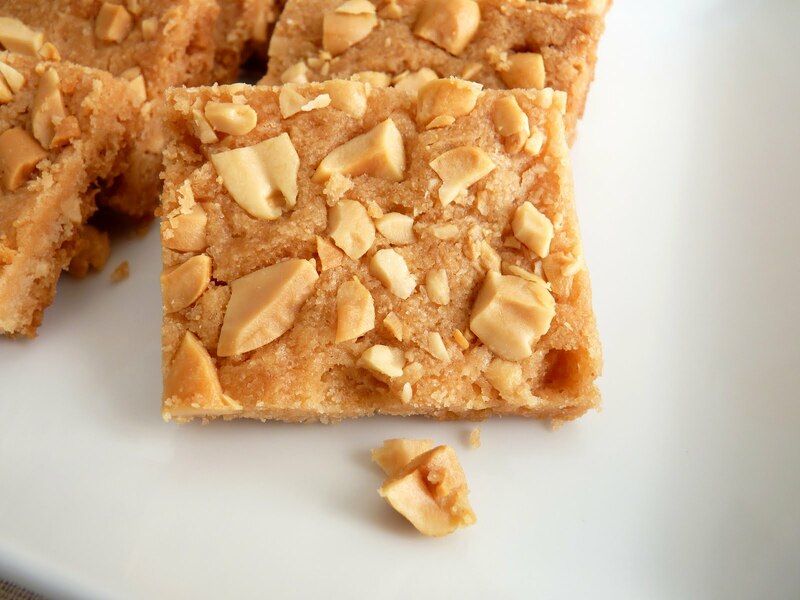 If necessary, cover with a piece of wax paper or parchment and use a rolling pin to press the peanuts into the dough. Bake for 23 - 25 minutes until golden brown, rotating the sheet about halfway through. Cool cookies in the pan for about 10 minutes and then remove to a flat surface and slice into portions. Crisp. Buttery. A distinctive shot of the best and brightest coffee. The richness of walnuts. All of these favorite things co-mingle deliciously in this fabulous cookie from Alice Medrich. This is an adult cookie. In addition to the usual flour, sugar, butter and salt, there’s a bold level of coffee and a splash of brandy in the mix. It’s rich with all of these elements in perfect balance. Packed with flavor and texture, it’s all there in wonderful detail in every bite. The cookie dough comes together in the bowl of a food processor, which means it can be assembled without much time or forethought if you have all the ingredients. 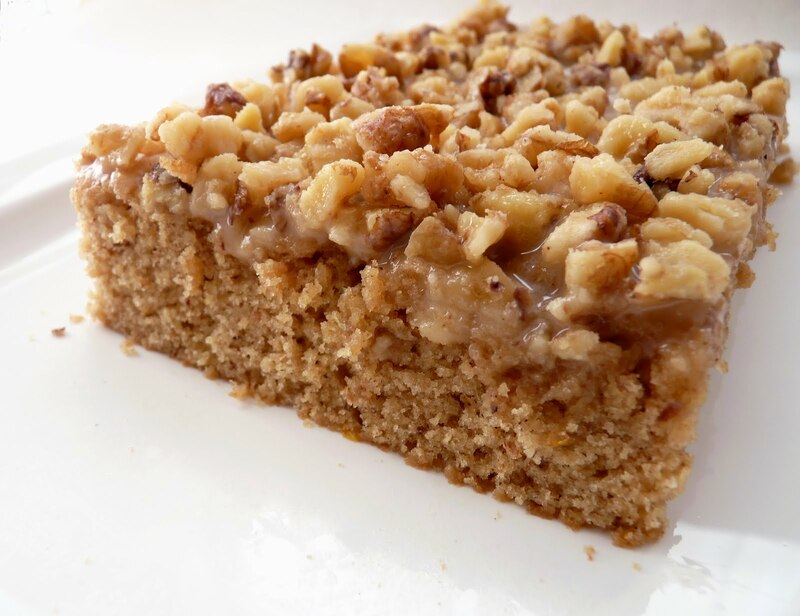 The nuts are finely ground with the flour, so you’re biting into a very smooth and delicate crumbly texture. And, as we all know, it’s all about the crumbs, the ultimate cookie achievement. Don’t you find it just a little bit difficult when you see a recipe that informs you that the cake or the cookie or whatever tastes better the next day? This is true for pastries that have a complex flavor profile with spices or strong flavors like coffee. When they are allowed to ripen and settle in over a day, the flavor does improve. This is one of those recipes so it bears repeating. Taste a couple of them and, if you can, store the remainder in an airtight container and enjoy them the next day. You may have to hide the cookie box. Good luck. This is every bit a recipe to stash in your cookie file for those times when you need a gift or something to go with a hot beverage, when only a good cookie will do. 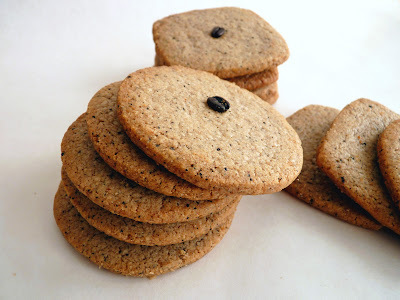 - Alice Medrich bakes these cookies on ungreased baking sheets for better browning. She suggests foil if you want to prepare the sheets. I used parchment. - Do be sure to garnish each cookie with a coffee bean. They bake into crunchy coffee flavor blasts. - The cookie dough can be stored in the refrigerator for up to 3 days or frozen up to 3 months. 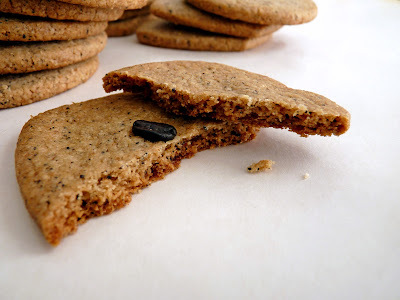 - If the dough begins to crumble at all when slicing into cookies, let it soften for a few minutes. 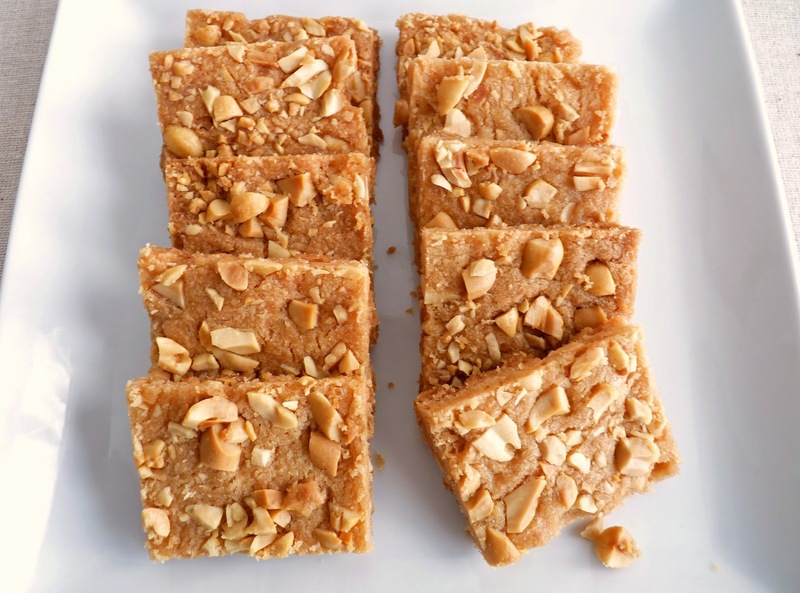 - I haven’t tried this with other nuts but I think almonds or hazelnuts would work nicely. - The baked cookies can be stored in an airtight container for at least a month. 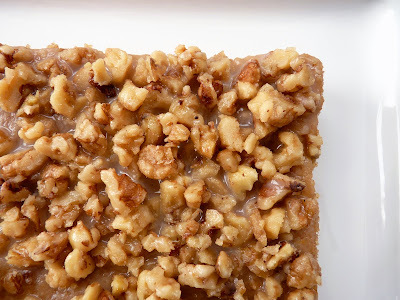 Place the flour, walnuts, sugar and salt in the bowl of a food processor and pulse until the walnuts are finely ground. Add the ground coffee and process to combine thoroughly. Cut the cold butter into small pieces and add to the flour mixture. Pulse until the mixture looks damp and crumbly. Add the brandy and vanilla and pulse until the dough begins to clump up around the blade. Remove the dough and gather the clumps into a ball. Form the dough into a 12” log about 2 inches in diameter. Wrap tightly in plastic wrap and refrigerate for at least 2 hours or preferably overnight. Cut the dough into 1/4” slices and place 1” apart on baking sheets. Press a coffee bean into the center of each cookie. Bake until light golden brown at the edges, about 12 to 15 minutes. Halfway through the baking process, rotate the baking sheets from top to bottom and front to back. Place on a cooling rack, letting the cookies firm up before removing. Cool completely. The winter’s earth tones of chocolate, caramel and nuts are supremely delicious but every year right about this time I feel the urge for a splash of color. My calendar tells me that the first day of spring is March 20, so there is definitely something in the air. 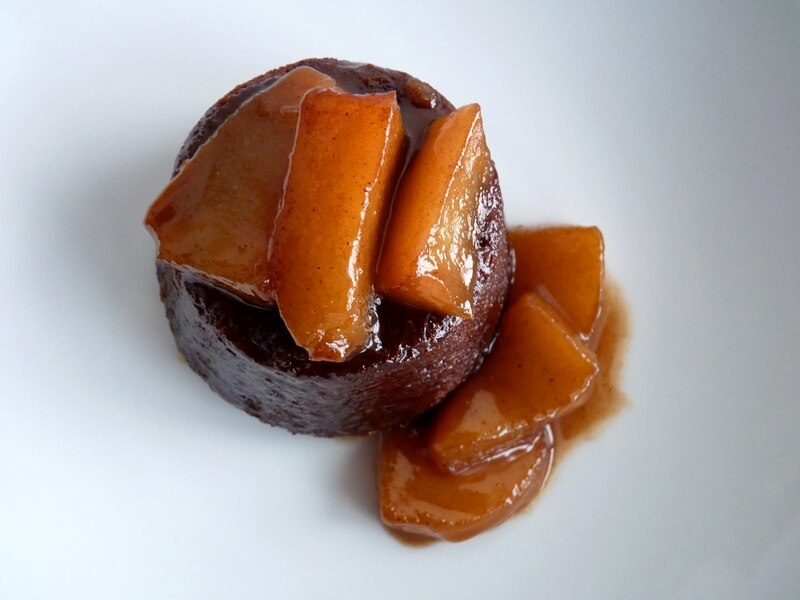 And as the new season approaches, it’s exciting to anticipate the bright palette of fresh strawberries, apricots, cherries, peaches, nectarines, figs and plums. So, in search of that brilliant spectrum, I bought some berries to brighten our table. I love the lightness of yogurt mousse in combination with a cool gelée. This particular colorful mix incorporates the natural deep red hue of hibiscus flowers, also known as flor de Jamaica, to make a strong sweet tea. 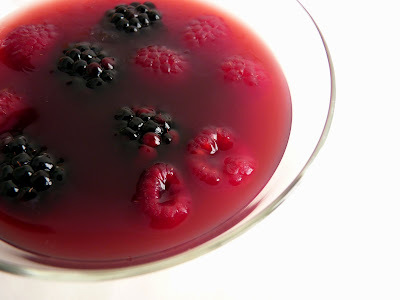 Then I just toss in a few raspberries and blackberries to brighten the flavor, add to the texture and deepen the color. In combination with a creamy mousse, it's a good way to transition to the longer and brighter days ahead. Incredibly simple to put together, it delivers a good dose of sunshine as the last days of winter fall away. Here’s to the rapid approach of a gorgeous and fruitful spring!! 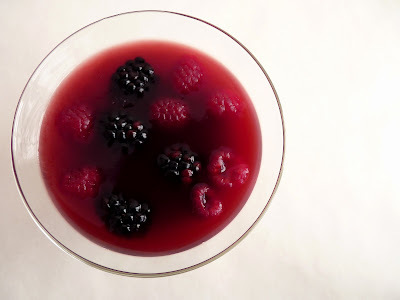 - The hibiscus tea needs to be pretty sweet to counteract the tartness of the berries. - When blooming gelatin, sprinkle the gelatin powder slowly into cold water rather than pouring water onto powdered gelatin, which causes the gelatin to form clumps that will not dissolve and will ruin the texture of the final product. Once you’ve added the gelatin to the water, do not stir. The gelatin and water mixture will turn opaque and look sort of like applesauce. 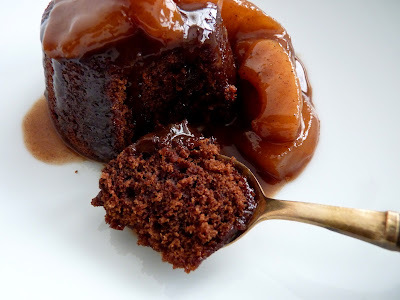 When ready to proceed with incorporating it into the recipe, heat gently to liquefy so it can be combined smoothly and thoroughly with the dessert mixture. So it goes like this: gelatin powder sprinkled slowly into cold water becomes gel and then is transformed into liquid and combined with the ingredients, which are then chilled to set up. - I don't recommend liquefying bloomed gelatin in a microwave because it will have a tendency to boil, which ruins it. - To avoid splashing or spilling, I use a large glass measuring cup to pour the hibiscus gelée into the glasses. - When you add the berries to the gelée, nudge them with your fingertip so they’ll submerge. - Substitute your favorite colorful juice or tea for the hibiscus, such as rooibos tea or pomegranate juice. As always, adjust sugar to taste. For the Yogurt Mousse, bloom the gelatin by sprinkling it into a small cup containing 2 tablespoons of cold water. Do not stir. Let it sit for 5 minutes until the water fully absorbs the powder. Whisk together the yogurt and sugar. Add the vanilla and lemon juice and combine thoroughly. Liquefy the gelatin by placing the bottom of the cup in a small saucepan with about an inch of simmering water. Add the liquefied gelatin to the yogurt mixture and blend thoroughly. Pour into 4 – 6 serving glasses or cups. When the Yogurt Mousse has set up, begin the preparation of the Hibiscus Gelée. Place the hibiscus tea leaves in a heatproof bowl. Pour the boiling water over the tea. Add the sugar, honey, lemon juice and orange peel and steep for 20 minutes. Strain into a clean bowl. Place 2 tablespoons of cold water in a small dish. Sprinkle the gelatin over the water. Let it sit for 5 minutes to bloom. Liquefy the gelatin by placing the bottom of the cup in a small saucepan with about an inch of simmering water. Add the liquefied gelatin to the hibiscus tea and whisk thoroughly. 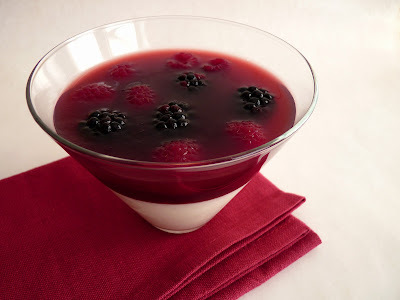 Pour onto the set Yogurt Mousse and distribute the berries in each serving. Refrigerate about 2 - 3 hours or until set. It’s March! And it looks like the atmosphere is determined to deliver more rain and snow. So naturally that conjures up thoughts of a cozy meet-up of spice and pears and that soother of all souls, chocolate. 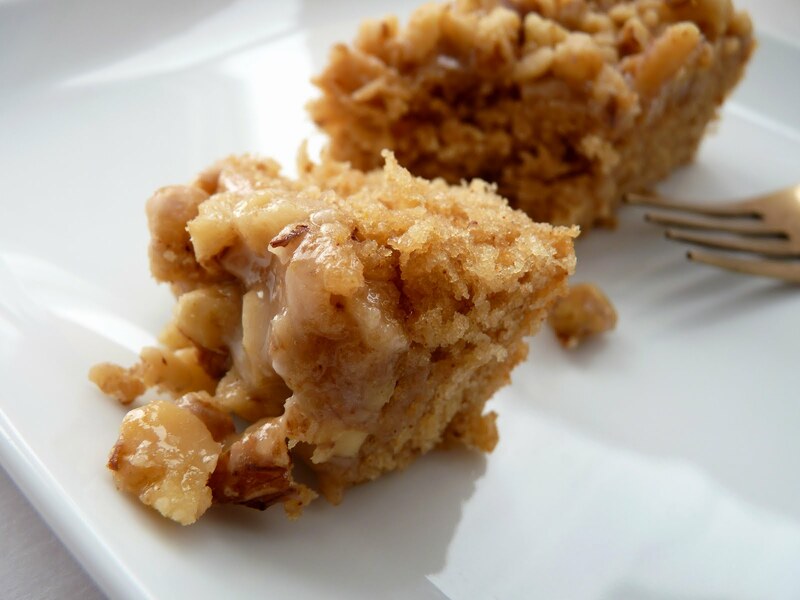 It feels like a good time for a dish of some down to earth dessert that delivers a good dose of comfort and pure pleasure in this wintry climate. The Fastest Fudge Cake is from chocolate powerhouse Alice Medrich. The recipe is not at all fussy - a quick snap of the fingers and it’s ready to go in the oven. The butter is melted rather than creamed and the whole thing comes together in one bowl, so it comes in handy as a last minute preparation. For this dessert, I’ve baked just a half recipe, which amounts to seven cupcakes. 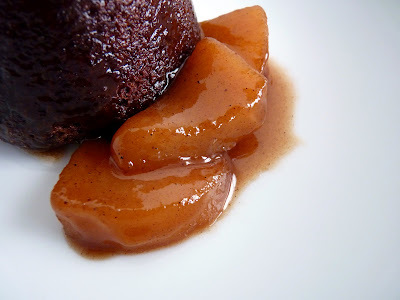 The Very Spicy Caramel Pears are out of Room for Dessert, the great first cookbook from David Lebovitz. 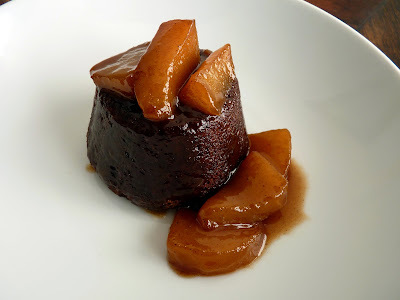 The pears are baked in the oven in an easy caramel sauce composed of butter, brown sugar and the warmth of some very pungent spices and a blast of booze. When they’re done, the sauce is strained and reduced with a splash of cream added to smooth things out. So if this weather has put a crimp in some of your best laid plans for getting around town, make the best of it. If you’re in the mood for a warm indulgence on a cold day, this composition from two of our best dessert authors should fill the bill. - I use an ice cream scoop for uniform portioning of the cake batter. - Fill the empty wells of your cupcake pan 1/3 of the way with water to keep the entire pan at an even baking temperature and prevent it from over-heating. - I list the baking time for the cakes as a spread of 15 – 18 minutes because ovens vary so greatly. Be sure to check them on the early side to avoid over-baking and dry cake, especially if your oven runs hot. The cakes are done if they spring back when touched. A toothpick test should come out with a few moist crumbs. Let them cool in the pan for just a minute and then remove the cakes to a wire rack. Removing them from the residual heat of the pan helps to keep them from becoming tough and rubbery. 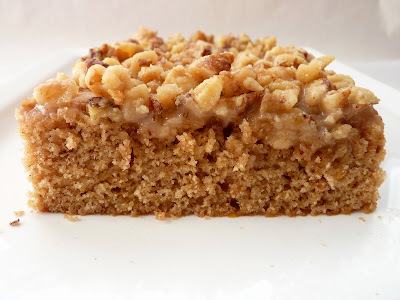 - If you prefer, make the whole cake recipe and bake in an 8” or 9” cake pan. The full recipe is at Fine Cooking. - Steam burns can be very painful. When removing the foil from the baking dish, lift the corner that is farthest and away from you to avoid burning yourself. - You can leave the cream out of David’s spicy caramel recipe if you prefer. Substitute your favorite spices. It would also be very delicious with sliced apples, baked for about 25 minutes. David serves his recipe with vanilla ice cream. - For presentation, I sliced off the slight dome of the cupcake and inverted onto the plate. - Sadly, David's Room for Dessert is out of print and now costs a small fortune if you can find it, but many of those recipes (completely updated and revised) are featured in Ready for Dessert along with a selection of new recipes. For the cake, preheat oven to 350 degrees. Grease 7 wells in a standard cupcake pan. Sift the flour, cocoa powder, baking soda and salt. Combine the melted butter and brown sugar. Add the egg and vanilla and stir until thoroughly combined. Add the flour mixture all at once and stir just until all the flour is moistened. Pour the hot water over the batter and stir just until it’s incorporated and the batter is smooth. Scoop the batter into the prepared cupcake pan, filling each one about 3/4 full. Bake about 15 - 18 minutes or until a toothpick inserted in the center comes out clean with just a few moist crumbs attached. Cool cakes in the pan for just a minute and then remove them to cool on a wire rack. Increase the oven temperature to 400 degrees. Choose a baking dish large enough to hold the sliced pears in a single layer. Cut the butter into small pieces and place it in the baking dish with the brown sugar. Place the dish in the oven for a few minutes until the butter is melted. Crush the whole spices with a mortar and pestle or place them in a plastic bag and pound them with a rolling pin. Peel and core the pears and cut them into quarters. Remove the dish from the oven and add the crushed spices and liquor. Stir to combine all the ingredients. Add the pears and toss everything together to coat the fruit. Arrange the pears in a single layer. Cover the dish with foil and bake for 30-45 minutes, depending on the size and firmness of your pears. The pears should be easily pierced with a knife but not mushy. Stir and baste them a couple times during cooking to make sure they’re evenly coated with sauce. Remove the dish from the oven and lift the pears out of the cooking liquid and into a bowl. Scrape all the juices and spices from the baking dish into a sauté pan. Add 1/4 cup cream and cook over medium heat until the mixture turns a deep color, thickens and caramelizes. Strain the finished sauce over the pears and serve with the chocolate cake.